Which of these options do you think would be the best way to learn something new, or improve something you already do? Option 1? It’s a good way to start. Option 2? Talking about it (conscious mind activity) would probably set you back rather than forward. Option 4 is arguably best but using a combination of 3 and 4 is necessary for optimal results. The use of mental practice in sports is universally accepted, but many people do not realize that mental practice works, not only in sports, but in everything—sales, public speaking, school, design, art, and even building muscle. Mental practice works because your subconscious mind does not know the difference between real and imagined. It doesn’t care whether you imagine something or experience it—it’s the same. In both cases, it’s brain cells firing in a certain pattern and sequence. Practicing in your mind’s eye can be even better than physical practice. For example, when you rehearse throwing darts in your mind, your toss is perfect, and the correct neurological pattern is fired. When you toss darts in the pub, you rehearse your same old toss. Thus, imperfect throwing technique is reinforced instead of the ideal you are striving for. When you rehearse a speech in your mind’s eye, for another example, you learn it at a subconscious level where, for one thing, you gain an inner confidence. Then, when you give it at work, it sounds more sincere and you emote self-confidence. In addition, when you practice in your imagination, you recognize weak points in your presentation that need editing and you anticipate questions. When I used to mentally practice technical presentations, I would hear myself (my subconscious) asking questions. As a result, I amended my talk to avoid questions and I was prepared for queries from the audience. “What fires together, wires together.” The more you practice in your mind, the more you wire the patterns for a perfect performance. So if you want to improve your golf, increase sales, perform perfectly in front of an audience without nervousness, or design a better widget, take five or ten minutes a day to practice mentally. Ah, but there is a catch. You must do your mental practice in the alpha state of mind, not the awake (beta) state—more about that next time. P.S. More information on exercising: All runners in a study group benefitted the same, whether they ran five minutes or thirty minutes a day (The Week, Aug. 15, 2014). 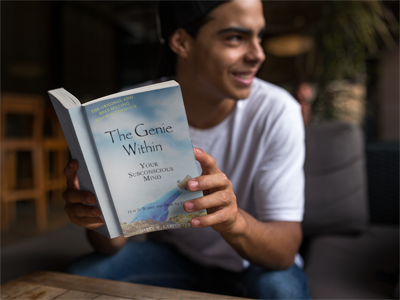 See The Genie Within Newsletter No. 7.